The staff at the University of Maine at Presque Isle’s health and wellness facility are celebrating a Week of Wellness between Sept. 10 and 15, providing campus and community members of all ages with fun and free activities focused on healthy living. Gentile Hall is hosting its Week of Wellness in conjunction with UMPI’s Homecoming 2012 Weekend. The event is sponsored in part by Cary Medical Center. The week’s activities are being led by Keli Marston, UMPI’s Fitness and Wellness Coordinator, and Amanda Baker, UMPI’s Recreation Programs Coordinator. Marston explained that the Gentile Hall staff wanted to do a health and activity-focused event during Homecoming and give community members a chance to meet her and Baker, Gentile Hall’s newest staffers. The fun begins on Monday, Sept. 10, with a free orientation to all of the equipment in the Gentile Hall weight room. Marston will be leading group sessions throughout the day for this activity and showing participants how the strength machines work and how best to utilize them to get a great workout. Sessions will be held from 10-11 a.m., Noon-1 p.m., and 5:15-6:15 p.m.
On Tuesday, Sept. 11, Marston will offer a free introduction to the new fitness equipment in the facility – including the TRX Suspension Trainers, Bosu Balls, Stability Balls, Med Balls, and Mini Bands. This activity is meant to help people feel more comfortable around the new equipment and learn how to use it safely and effectively. Group sessions will be held from 10-11 a.m., Noon-1 p.m., and 5:15-6:15 p.m.
Mid-week, organizers invite the public to try out a free nutrition session with Colette Thompson, a new University of Maine System-dedicated RiseUP Health Coach. RiseUp is the UMS Employee Wellness Program. Sessions will be held on Wednesday, Sept. 12, from 11 a.m. to 1 p.m. Thompson will share basic principles of eating smart and living a healthy lifestyle. On Thursday, Sept. 13, all are invited to take part in a free fitness class with Marston from Noon to 2 p.m. This class will combine a step class and a fit camp all in one. 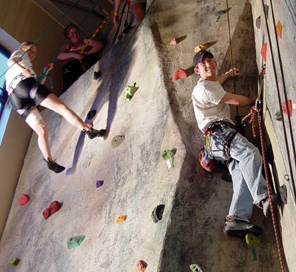 Later that day, Amanda Baker will host a Rock Climbing Party from 7 to 9 p.m. During this time, the climbing wall will be free for all ages. The event will include climbing, bouldering, music, belay certification for those interested, climbing instruction, and lots of fun. The very next day, the community will get a sneak peek at a new class called Leisure Stretch and Flex, which focuses on balance, flexibility, and core strengthening. This free activity is a beginner class that Marston will lead from Noon to 1 p.m. on Friday, Sept. 14. Want to try out the Gentile Hall pool? Baker will be offering a Kayak Roll Clinic the same day from Noon to 2 p.m. This event is free for everyone, though participants must be at least 18 years of age or have parental supervision. Kayaks, paddles and PFD’s will be provided. To cap off the week, Gentile Hall will be open to the public on Saturday, Sept. 15, from 2-5 p.m. and use will be free of charge. There will be a Family Swim and Gym in the pool area, and visitors are also encouraged to check out the 37-foot rock wall, the elevated track, the multi-purpose gym, and the state-of-the-art fitness center. Marston and Baker encourage everyone to stop by and check out the facility, especially anyone who has never visited before. For more information, contact Marston at 207-768-9773.